Riverlake Plantation is one of Pointe Coupee Parish's premiere examples of the Creole architectural influence. 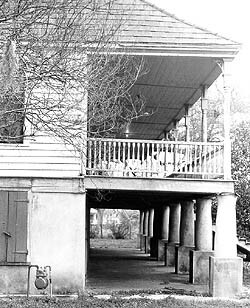 During Riverlake's history, the plantation house underwent three major periods of construction covering 1820, 1840 to 45 and 1890, respectively. Set on the west bank of the False River, Riverlake began around 1820 as a well detailed, two-story, galleried structure with brick on the lower story and bousillage construction above (mud and animal hair mixture applied inbetween timbers). The upper story was originally three rooms wide and one room deep, while the lower story consisted of numerous smaller rooms. Around 1840-45, the entire roof structure was replaced, the present dormers added along with the front and rear upper galleries with their enclosed sides and cabinets. After this second period of refurbishment, Riverlake was the typical late Creole plantation house; unlike early Creole plantation homes which were detailed in the Colonial style, Riverlake had Greek Revival details. In the late 19th century, a two-story rear kitchen wing was appended to the 1840-45 rear gallery. Minor changes included replacing earlier Greek Revival columns with Eastlake columns. In the 1890s and early 1910s Bungalow style glass doors replaced the French doors opening onto the upper gallery, and the exposed brick walls were covered with cement throughout the house. Riverlake Plantation also boasts two surviving although deteriorated pigeonniers (structures used by upper-class French for housing pigeons) which are noteworthy, rare features of plantation homes. Riverlake is one of a select group of major Creole raised plantation houses which are Pointe Coupee Parish's largest and oldest buildings. Riverlake is also notable because of its size, and is wider than most traditional plantation houses of its type. Its Creole features include its hall-less, cabinet plan, its heavy hip "umbrella" roof complete with the customary pair of small dormers, and its basic, two-story, open galleried form. Riverlake is located on Hwy.1 just west of its intersection with Hwy. 416 in Oscar. It is privately owned, and not open to the public.